With 45 million people passing through its door annually, things are bound to go wrong from time to time. Missed flights, lost bags, screaming kids, someone's emotional support peacock causing a havoc. However, Monday's incident at Gatwick Airport will probably be a new one for many travelers. The London airport had an issue with its video monitors. Per a tweet from the airport, "damage to a Vodafone fiber optic cable" prevented the airport from displaying flight information on screens. 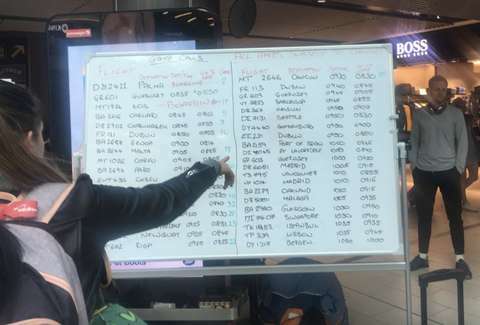 Instead, flights were listed on whiteboards, and the images make it look like utter chaos. Due to damage to a Vodafone fibre optic cable, we are continuing to display our flight info manually. Contingencies are working - we have whiteboards and friendly staff on hand to help, and tens of thousands of passengers have departed on time. Apologies for any inconvenience. Gatwick tweeted that "tens of thousands of passengers have departed on time" and no flights were canceled. Though, the airport told the BBC that a "handful of people" missed their plane. It's no small feat to direct tens of thousands of customers from airline front desks and whiteboards. The images and stories shared on social media look like the place became the wild west, but at the same time, kudos to the employees who didn't create the problem and look to have been doing the best they could. The system failed, but they kept things chugging along. A spokesperson told the BBC at 17:00 BST that the issues were resolved and monitors were operational.